Aura, New York was alive with visitors from all over the country this weekend. In the Sunday paper from nearby Syracuse, a woman from California was interviewed. The sale began on Thursday and and ended on Sunday. I went on Sunday with my family who lives in nearby Skaneateles. MacKenzie-Childs is very high end ceramics, painted tin dishes and everything you can image. The black and white checkerboard pattern is certainly a theme and trade mark. It is very pricey so the Barn Sale of 70% off is very appealing to the masses. Let me tell you that is is quite expensive at 70% off in my opinion. In small doses, it is a fun colorful accent to most decors but in my taste a little goes a long way! I will just show you lots of pictures from this sale and you can can get an idea. My granddaughter loved the furniture which reminded me of ALICE IN WONDERLAND which when I think about it pretty much describes it all ! 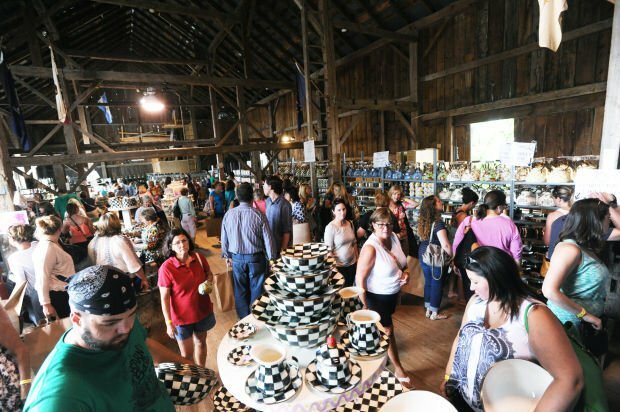 The Barn Sale is every July in the third weekend from Thursday though Sunday. Mark your 2018 calendar if you are interested! 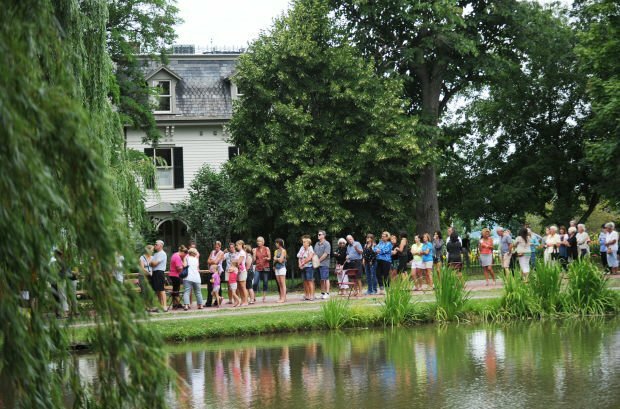 Waiting patiently in line with the spectacular view of the pond and English Gardens. Start in the barn for the dishes and accessories in the trademark checkerboard either black and white or yellow and white. A few brave men, shopping carts, bags and bargain hunters! Violet loved the furniture. . . . she is 7! 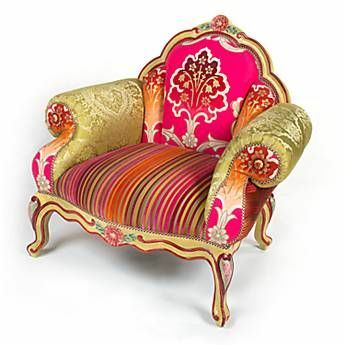 I think Queen Victoria would love that chair! Well, I think I have given a pretty thorough taste of these designers. This entry was posted in art, artists, Designers /Designs, Uncategorized, USA and tagged Auroa New York, furniture, high end prices, MacKenzie- Childs Barn Sale 2017, shopping. Bookmark the permalink.